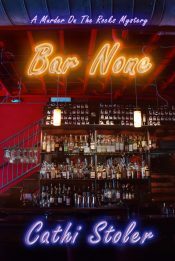 BAR NONE, set in New York City, features Jude Dillane, owner of The Corner Lounge on 10th Street and Avenue B. When Jude finds her friend and landlord Thomas “Sully” Sullivan’s work pal, Ed Molina, dead in a pool of blood in Sully’s apartment, she’s sure it wasn’t suicide as the police suspect and adds murder to her plate when she helps investigate a case of major fraud at the Big City Food Bank. Jude and Sully get more than they bargain for when they follow the leads left by the victim. The secrets Ed carried are passed along and the target now falls on their backs. They soon discover that uncovering corruption means uncovering the killer. They just have to stay alive long enough to bring justice and reveal the truth once and for all. contact@claystaffordbooks.com COPYRIGHT © American Blackguard, Inc. 2006-2017 ALL RIGHTS RESERVED. The views and opinions expressed on this website are those of the contributing authors or speakers and do not necessarily reflect the official opinions of Clay Stafford Books, its parent company American Blackguard, Inc., its staff or management, its volunteers, or any other included authors or involved personnel. If you note any suspicious or offensive activity or content, please notify us immediately.